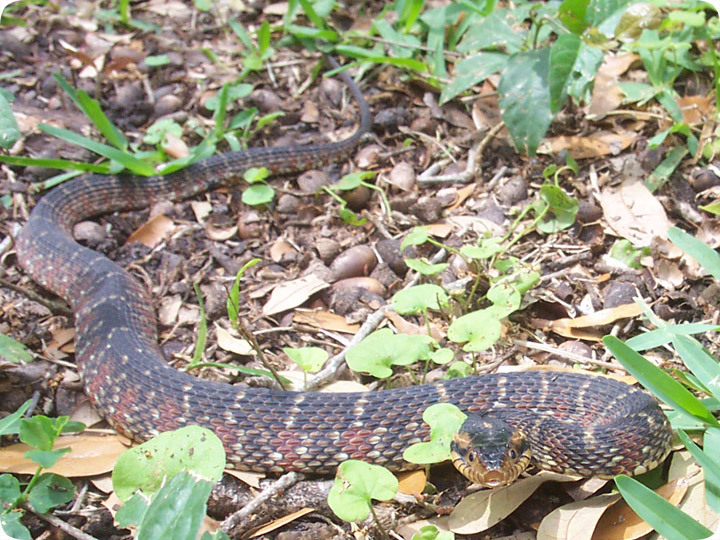 04.11.2004 - This is a Banded Water Snake (Nerodia fasciata). I have photographed it outside of its usual aquatic habitat. I was called to remove a snake from a home, and I was told that I'd be extracting a Cottonmouth. I arrived at the house and was directed to the ornamental pond in the front landscaping, and sure enough, there sat the above snake, a species that I had never seen before. It looked a bit darker in the rocks and water, and like most water snakes it had a thick body. I captured it with my snake tongs, and it struck several times as I transferred it to my snake bag, and I noticed that it had a white mouth. I thus concluded at the time that it was, in fact, a Cottonmouth. Oops, I was wrong, and it was careless of me. At least I took safety precautions, and it's better to be wrong about a snake being venomous instead of harmless as opposed to vice-versa, but still, I committed an error that many laypersons make about snakes, and which bothers me - assuming that a harmless snake is dangerous. I was aware that Cottonmouths have differing and more distinct colors and patterns when small than the mostly black adults, and the body shape, behavior, and white mouth made me believe that it was a Cottonmouth, but upon further research, I do see that it is a harmless Banded Water Snake. Aggressive, perhaps, but no fangs, no venom. The Banded Water Snake lives primarily in the Southeast United States, where it is fairly common. It's found in most bodies of water, and it doesn't live in dry areas. It grows to about 4 feet as an adult. It feeds mostly on amphibians and fish. It gives birth in summer to live young. In these respects its similar to the Cottonmouth, and many other water snakes, such as the common Northern Water Snake. If you see one, as usual with snakes, the best policy is to live and let live.